Personalized stationery sets make the best gifts -- for yourself or someone special! Sets of 10 and 15 are packaged in a resealable clear sleeve. Sets of 20 or more are packaged in a white gift box with clear lid. The option to leave a gift message is available at checkout. 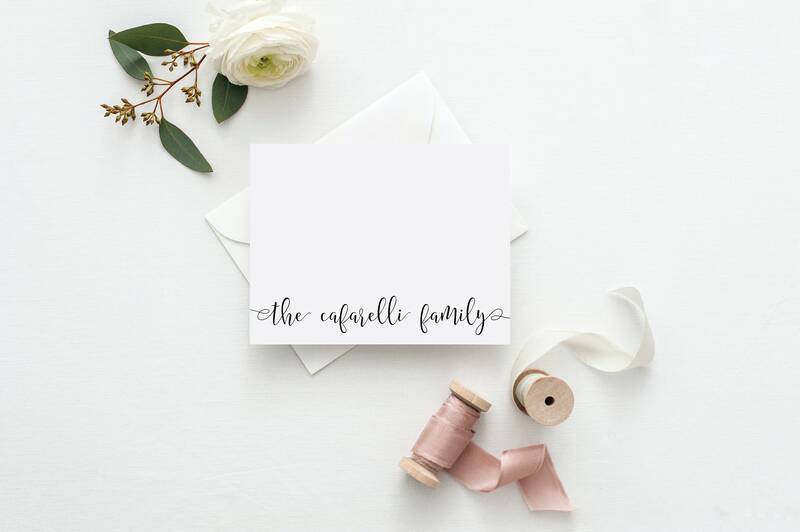 Messages are handwritten on a small white card and included with the package. The price per card decreases with larger set sizes; these discounts are reflected in the prices shown. ➸ Sales tax is applied to all orders shipped within the state of Ohio. The tax rate is 7.5%. ➸ Swoon Paper Co. ships via FedEx within the United States only. Ground and expedited shipping options are available at checkout. ➸ A shipping notification email, with the tracking information, will be automatically sent to the buyer on the label’s ship date. ➸ Packages will be shipped to the address listed on your Etsy receipt unless an alternative address is provided in the order or through an Etsy Conversation. ➸ PLEASE NOTE: Swoon guarantees that packages will be prepared and shipped according to the stated processing and shipping guidelines. Swoon DOES NOT guarantee actual delivery dates and is not responsible for delays within the postal system. Swoon Paper Co. takes immense pride in the quality of its products and attention to detail. Every effort is made to ensure that your items exceed your expectations. However, if you are dissatisfied with your order in any way, please contact me immediately. ➸ Orders may be cancelled for a full refund within 24 hours of purchase. After 24 hours, orders may be cancelled for a partial refund. Please contact me for details. ➸ Due to the customized nature of personalized goods, items may not be returned or refunded. ➸ Should there be an error with your order, please contact me immediately. ➸ In the event that Swoon is responsible for an error with your item(s), immediate arrangements will be made for a prompt replacement, refund or credit towards a future purchase. ➸ Standard processing time is 2-4 business days (plus shipping time, noted above). ➸ If only partial information is provided at checkout, the processing time resets and begins once the missing information has been collected. ➸ If your order requires proof approval or you have requested a proof prior to print, processing time begins after receipt of approval. Proofing requires an additional 1-2 business days for processing. ➸ Processing times are subject to change. 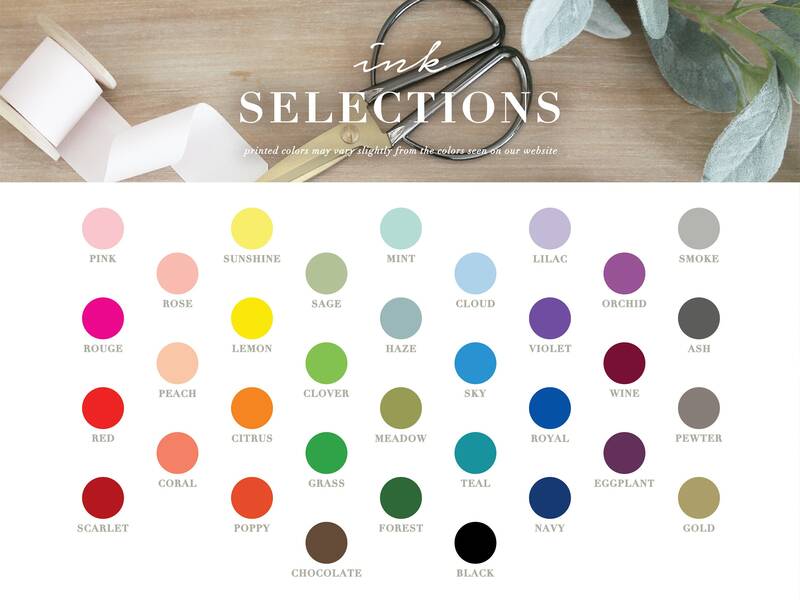 Temporary changes will be noted in the Swoon Paper Co. announcement section. ➸ Proofs are always available UPON REQUEST. 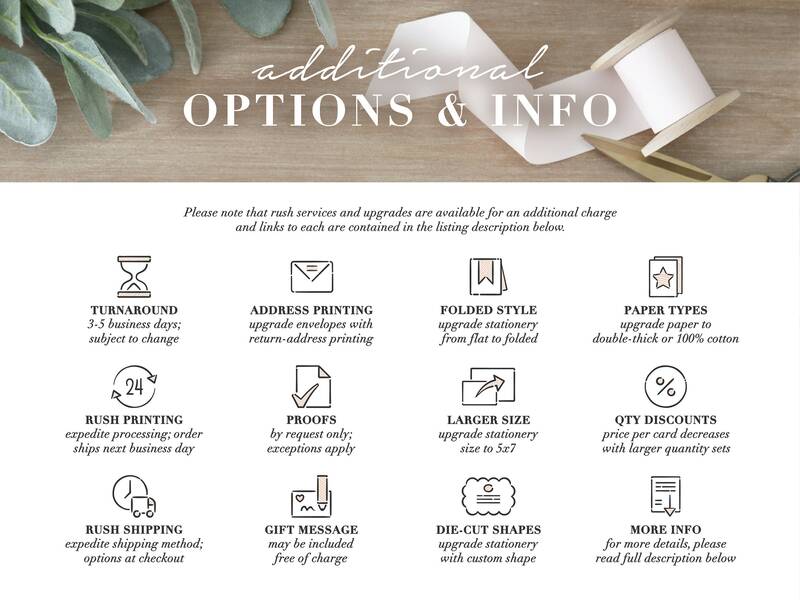 ➸ Please REQUEST A PROOF when placing an order or shortly thereafter by contacting Swoon Paper Co.
➸ Proofs are sent within 24-72 business hours after purchase. ➸ A proof will be submitted if Swoon Paper Co. deems it necessary to obtain the buyer's approval in order to move forward; the order will not be processed until receipt of approval. ➸ If an order requires a proof and/or one has been requested, orders will not be printed until approval has been received. ➸ Proofs are submitted as PDFs through Etsy 'Conversations.' At times, proofs may be submitted to the buyer's email address on file with Etsy. ➸ The Swoon Paper Co. logo is tastefully printed on the back of all our paper goods. In some instances, this may be removed upon request. ➸ Swoon items are prepared in a smoke-free environment. ➸ Due to variations in monitor + device displays, printed colors may vary from what is shown on your screen. ➸ Please contact me for additional customization. Additional fees may apply. Swoon Paper Co. has a unique partnership with a family-owned and operated fine-stationery printing company. This partnership allows us to provide superior quality products printed on the finest materials and using the highest-end, state-of-the-art equipment. ➸ All Swoon items are printed using state-of-the-art HP Indigo Digital Presses. ➸ All Swoon products are printed on the highest quality eggshell stock, varying in weights from heavy text-weight to luxurious double-thick stock. ➸ Products are printed and finished -- carefully inspected -- and packaged with care in custom Swoon packaging. ➸ Orders are shipped by my team using FedEx ground. Choosing FedEx offers a higher degree of reliability, consistency, and accountability. If you have any questions regarding our partnership, please feel free to contact me either by Etsy or by email to sarah [@] swoonpaperco [.] com. Will I receive a proof prior to printing? Upon request. 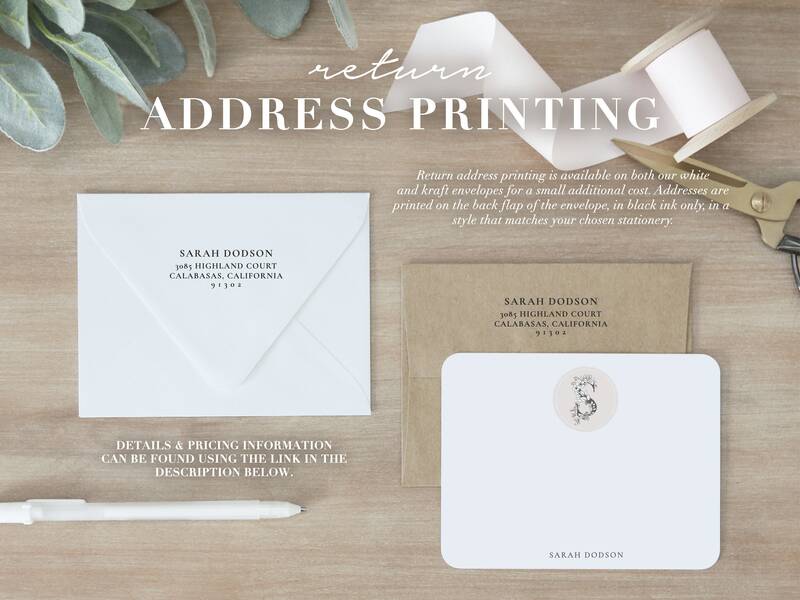 Proofs of social stationery + desktop items (notecards, notepads, etc) are not sent prior to printing unless specifically requested OR if the order exceeds 100 cards. Proofs of invitations + announcements are always provided prior to printing and are submitted within 48-72 business hours of purchase. Proofs are submitted as PDFs through Etsy 'Conversations.' At times, proofs may be submitted to the buyer's email address on file with Etsy. How will my order be packaged? All orders are carefully packaged in Swoon Paper Co. branded packaging. Stationery sets of less than 20 are bagged in a branded, resealable clear sleeve. Stationery sets of 20 or more are packaged in our premium white stationery box with a clear top and closure band. Notepads are bagged in a branded, resealable clear sleeve. 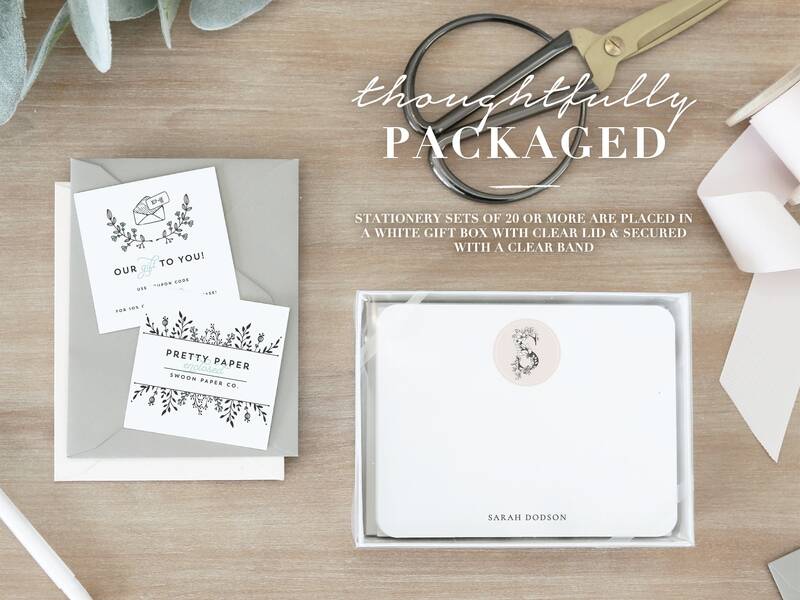 Invitations + announcements are packaged in our premium white stationery box with a clear top and closure band. 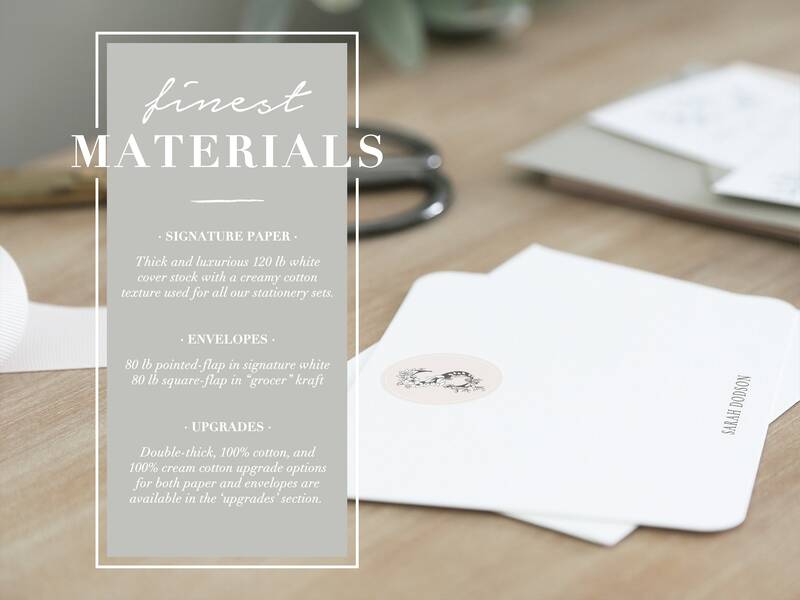 *Please note that due to irregular size, #10-sized invitations + announcements (4 in x 9.25 in) are unable to be boxed and will be bagged in a resealable clear sleeve. All orders ship in a white shipping box, padded with recycled packing paper to protect items in transit. May I include a gift message? Yes! If your order is going straight to a lucky recipient, please provide a gift message in the 'Note to Seller' section at checkout. 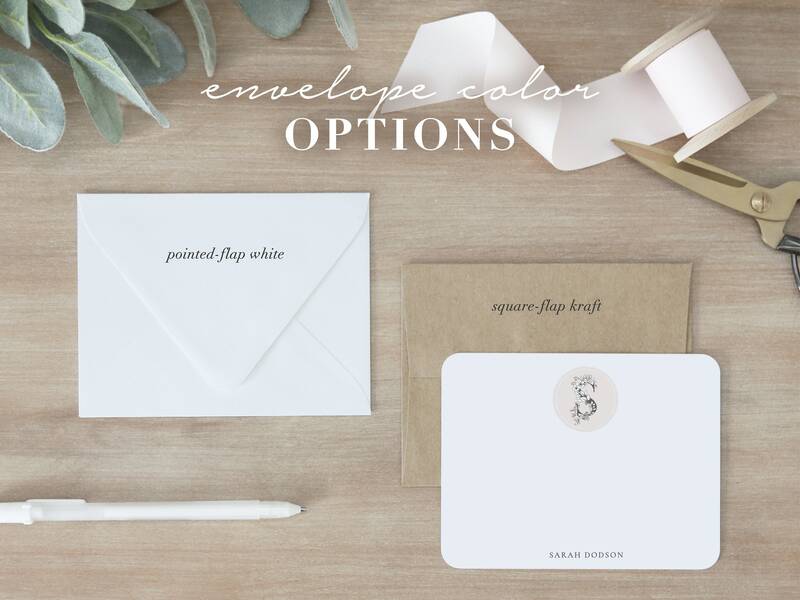 Your message will be handwritten on a small white card and placed in the package. We do not include invoices with our shipments, so no pricing will be revealed. Where do I leave my information for personalization / customization? All of your customization and personalization information should be left in the optional 'Note to Seller' box presented at checkout. Providing your information there ensures that it is connected to your order. Please also leave any other information you feel is necessary in order for us to properly prepare your items. Do you offer combined shipping? Yes! Additional items ship at no extra charge. Orders containing one or multiple items ship for a flat rate of $7.95. Combined shipping calculates automatically during the checkout process. Combined shipping is available for one shipment to one address. How can I expedite my order? We are happy to provide both rush printing services as well as expedited shipping options. RUSH PRINTING ensures that your order ships on the NEXT business day (within 24 business hours). EXPEDITED SHIPPING options are also available. FedEx 2-Day [$25.00] and FedEx Next Day [$45.00] may be selected at checkout. Is your logo printed on the stationery? Yes. The Swoon Paper Co. logo is tastefully printed on the back of all our paper goods. It is simply our name and website in small, black text. Do you sell digital files? 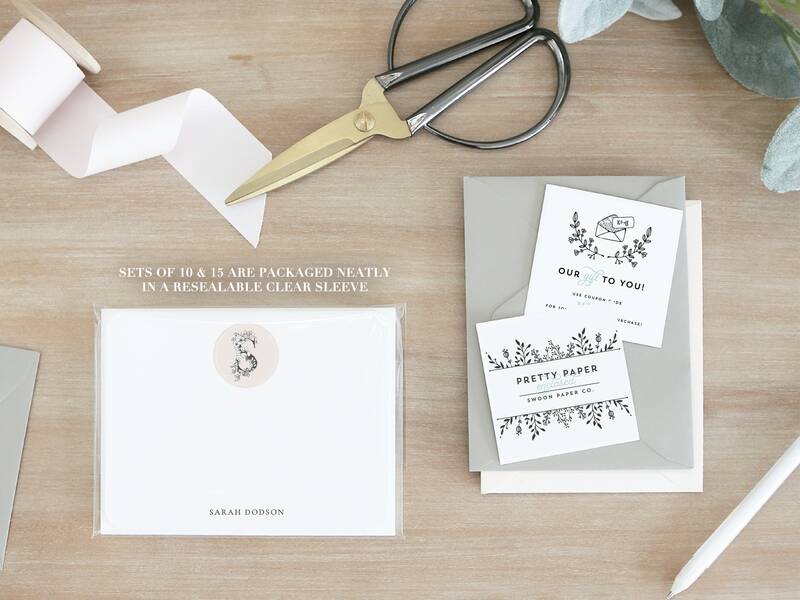 Currently, Swoon Paper Co. does not sell digital, printable or DIY files. Only physical, printed items may be purchased.